There have been many new recipes in the All That I’m Eating kitchen this year and this post is all about my favourites from 2015. That’s not to say that all the others aren’t worth a perusal but these are my most favourite; those which have become regulars on the kitchen table since I first made them, those that I remember simply for being indulgent and some which came about as a healthy (but delicious) take on a classic. 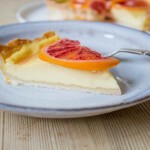 First up, and what a way to start the year, is my Blood Orange Tart with Caramelised Blood Oranges. A blood orange juice and zest infused custard topped with glazed sliced blood oranges is not only a welcome burst of colour in a grey January but a fabulous burst of citrus flavour in what can seem like a never ending month of cabbages. Full post here. I find I crave tropical flavours as we move closer to spring and these Coconut and Lime Biscuits are so easy to make, you probably already have most or all of the ingredients, and taste so good. They only take 30 minutes from start to finish (including washing up time!) so what’s not to like? Full post including a list of winter woes, which these help to banish, here. It’s not very often I’ll turn down a cup of tea, or a gin and tonic for that matter, so it seemed like a good idea to marry two of my favourite beverages together in my Earl Grey Gin Cocktail. Making a simple Earl Grey syrup to mix with gin and lemon for a lazy, surprisingly warm, spring Sunday is a joy. Full post here. Sticking with gin for a moment, and why not, I tried infusing some gin with some delicious summer flavours. 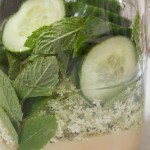 My Elderflower, Cucumber and Mint Gin is much quicker to infuse than something like sloe gin and so good simply mixed with tonic. Full post here. This is my healthy and (coincidentally) vegan take on chilli con carne, or chilli non carne more accurately. This Lentil and Black Bean Chilli is cheap to make, full of veg and you won’t even notice there’s no mince. Perfect if you fancy trying out something for a meat free Monday! Full post here. Peas are one of my most loved vegetables, I’ll put them in (almost) anything. The only thing I like more than peas are mushy peas. 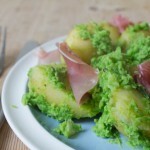 Made from fresh peas and Jersey Royal potatoes this recipe for Mushy Peas, Potatoes and Ham celebrates the best of the summer season. Simple to make, full of flavour and a great light meal, full post here. This cake is for the other bakers who are just like me; full of enthusiasm and chasing perfection but rarely achieving anything like what you envisaged in your head before you started. My Perfectly Imperfect Chocolate cake tastes absolutely cracking, because of my amazing (yes, self praising) cheat’s icing. Who cares if it’s a bit wonky? Full post here. This year seems to have been the year of pulses for me; I have probably eaten more lentils and beans this year than cumulatively in my life. With increasing interest and consumption comes experimenting and I worked on my Smoky Cowboy Beans recipe for a little while before putting it up until I was completely satisfied with it. Your baked potatoes will never be the same again. Full post here. If you’ve been reading my blog for a while you’ll know I love to forage for food but I don’t stop at simple sloe gin or wild garlic pesto. Oh no. For this Wild Garlic Tear and Share Bread I made some wild garlic butter and got baking. Well worth a try if you can get hold of wild garlic but it would also be great with wet, smoked or black garlic. Full post here. My Spaghetti with Balsamic Tomatoes, Mozzarella and Olives is just the kind of recipe I love; easy, quick and tasty. Perfect for midweek cooking when you want something speedy, filling and inexpensive these are the recipes I come back to again and again. Full post here. Next year I think there will be: much more experimenting with beans, lentils and grains; more vegetarian recipes as I am eating much less meat than I used to, indeed hardly ever; and some obscenely indulgent baking. I would really like to make more bread as it’s something I haven’t made much of before and I’m sure there’ll be some restaurant reviews, new products to try out and a bit of travel thrown in too. A very Happy New Year to you. I remember almost all of those dishes…you had a great year, Caroline. I look forward to more of your delicious creations in 2016. Hi Caroline, looks like you had an amazing year, can’t wait to see what this year brings. Happy New year to you!! What a delicious selection, if I can get hold of blood oranges where I am, I’d love to give your Tart a try. Such fun to look back at all the wonderful things that came out of your kitchen. Blogs are very handy for food memories. : ) Hope you had a great holiday and happy New Year!! Lentil and Black Bean Chilli and Bread is my favourite too! Loved this compilation. Thanks for sharing! Do visit my blog as well. A real collection of deliciousness… the tart is unbeatable!